While I try to stick to simple, healthy meals for this blog and for my family, sometimes I just need to flex my culinary muscles a little bit. This recipe for sous vide arctic char brandade in the Spring/Summer issue of Sous Vide Magazine struck me because a) arctic char is my favorite fish, b) fried stuff is delicious, and c) I’ve been dying to try something with aquafaba (a.k.a. chickpea water). Thanks to the encouragement of this gorgeous glossy mag, I've been firing up my sous vide more than ever lately. And frying stuff at home is a small luxury that I'm willing to pay the cleanup price for later. Labeled as “intermediate” in the magazine, this recipe was clearly developed by a restaurant chef and requires multiple steps before all the pieces come together in the form of deliciously fried bites of arctic char. There are four sous vide components, as well as frying and whipping. Because cooking four things in a long water bath was one thing too many, I made a few modifications to the original recipe in the magazine. I also added some tender spring baby chard greens and green garlic that I had in my kitchen. I replaced the garlic oil with some high-quality olive oil. I also added a touch of sriracha in the aquafaba aioli to give the whole thing a kick. Aquafaba is as magical as people say. It whipped up in a couple of minutes with my handheld immersion blender, and its mutest taste let the flavor of the fresh pepper and citrus shine. The brandade, while time-consuming, was absolutely delicious and a treat for a Tuesday. Before frying, make sure the oil is at the right temperature by checking one ball. You can serve these on their own over a bed of spicy watercress, like we did. Add all ingredients for the potatoes to a large sous vide bag, flattening and spreading to ensure even cooking. Seal and cook at 181.4°F/83°C for 2 hours. After cooking, mash potatoes and reserve. Next, cook the fish. Lower the temperature of the water bath to 161.6°F/72°C. Salt fish on both sides and place in large sous vide bag with the remaining ingredients. Seal and cook for 1 hour. After cooking, remove the sous vide fish fillet from bag and place in a large mixer. Add potatoes and chard into the mixer and slowly begin to blend together on slow setting. With mixer still running, slowly drizzle olive oil until fully blended. Using a small scoop, portion brandade into 1-inch balls. 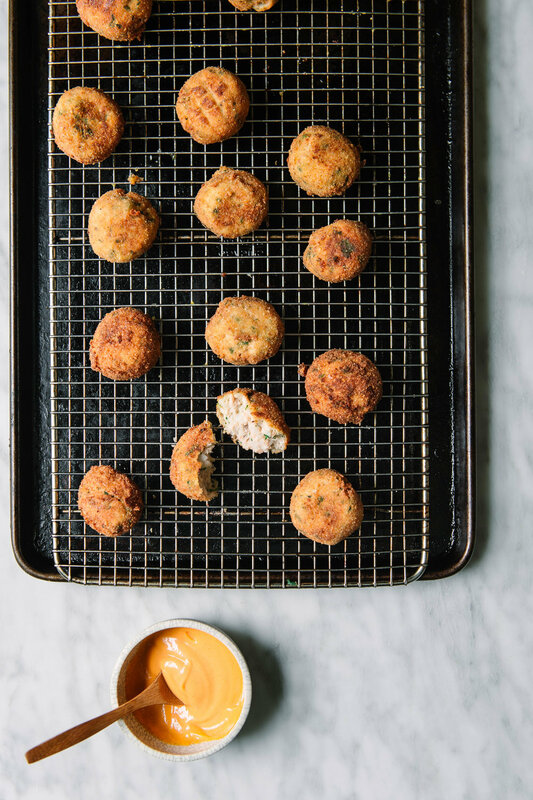 Beat eggs and dip brandade balls into egg wash, then coat evenly in breadcrumbs. In a large saucepan over medium-low heat, warm 2 inches of oil until it reaches about 350°F. Submerge the brandade balls in the oil and fry for up to 3 minutes, or until golden brown. Set aside until ready to serve. Meanwhile, make the aioli. Blend all the ingredients for the aioli, minus the grapeseed oil, using a hand or countertop blender on low setting. Slowly incorporate grapeseed oil until you get the desired consistency. (Be sure not to add oil too quickly or the mix will liquefy and will not stiffen.) Salt to taste. Serve the brandade balls with the aioli over a bed of spicy watercress and enjoy!